Some people talk to their therapists, or their bartenders. I talk to the people who cut my hair. When I was getting a trim earlier this week, we got on the topic of tattoos. She had lots, and I only have a couple. I want another one, a larger one, but I want it to be something meaningful to me, and I haven’t quite figured out what. “I have this recurring dream, though,” I told her. “Well, I’m in this desert landscape, and I’m following a coyote. I went running again yesterday morning. There are a number of trails that criss-cross not far from where I’m staying; I think I’ve explored most of the ones that are in easy reach, and I was running along one that I’d already traveled so I wasn’t expecting to see anything out of the ordinary like I did the last time. If you look closely at that photo (you might need to click on it to enlarge), you’ll see that I ran into an unexpected walker on the trail. The deer and I stood there staring at each other for a short while, and she didn’t seem inclined to go anywhere. (Blackberries have been in season, so I couldn’t blame her.) Luckily, I was able to backtrack a short distance and take a side path up to a parallel trail. Naturally, I was thinking about how writing can be like that. Sometimes you get to a point where you can’t move forward, or at least you’re not sure how. What should you do? Throw a deer in your path. Not literally, but give your characters something unexpected to deal with. Where do they go from there? Like me in the middle of my run, they might be able to work their way around to where you were trying to get them in the first place. And they might see something interesting when they get there: In my case, it was two deer standing at the top of a hill overlooking the trail where I was running. Writing prompt: If you go down to the woods…. 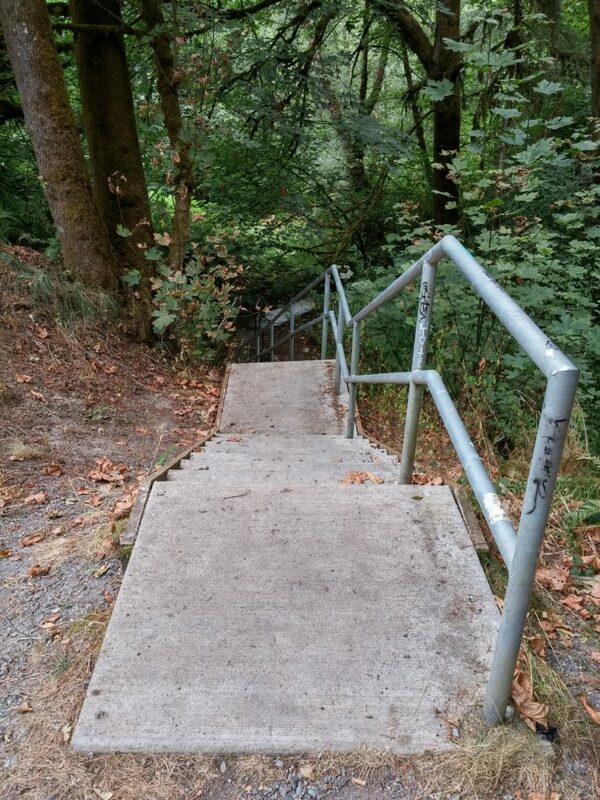 I was out running this past weekend in Olympia, and along one of the trails I happened across this staircase in the middle of the woods. My next thought was, hey, that would make a good writing prompt. Which is why you’re reading this now. See where the stairs lead you.